Halloween is just around the corner and that is prime season here at HalloweenCostumes.com! We want to help you with you and your family's costume choices. Sometimes it can be hard to find something creative, but we have a wide variety of easy costumes ideas for men, women and kids. These costumes come with the dress as well as the hood, and they come in a variety of vibrant colors. At just under $40, they're a great deal and your tween can use the furry hat all year-round. Another super cute option for girls are our animal costumes and would honestly look adorable and sweet on any age. In the time I spend with my nephew, know that little boys love the newest things. Right now he is all about Angry Birds and I know a lot of his little friends (girls and boys) are too! We have a variety of styles for this costume—all of them come complete with everything you need. Weather you want the full costume or just the Angry Birds costume t-shirt to build you're own. Another thing that's super popular for kids right now is superheroes, and with the success of "The Avengers" and "The Dark Knight Rises" this summer, we know these are going to be the hot costumes this fall! Luckily for you we have almost any DC or Marvel character you could dream of! These costumes all come with the bodysuit as well as the mask, and they are easy to get on and off your little guy. I also have a feeling that he is going to want to keep wearing these super rad costumes long after Halloween is over, so the prices being between aren't too shabby! It can be hard to find that really perfect costume that the whole family can enjoy. 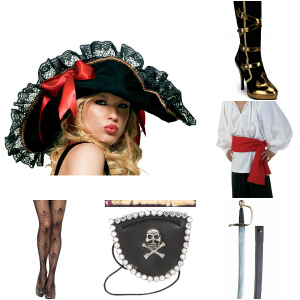 That is why we've made it really easy for you here; we have some really awesome pirate costumes that come with everything you could need at even more awesome prices. Pirates always seem to a be a huge hit and trend at Halloween. The great thing about that is that there are so many different styles you can chose from and you can easily add and take away from it to make it your own without inflicting on the costume. We have such a wide variety of styles, sizes and prices in our pirate department that we are sure to find a costume to suit your needs! Zombies are always another huge hit. And, again, these are costumes that you can have so much free creativity that they can be so much fun. We have such a variety of costumes with so many different sub-characters (a doctor, a punk rocker, school girl, celebrities—the list is endless) that you kind of just can't go wrong! These costumes are not only fantastically detailed and come with everything you could possibly need to scare your pals and neighbors! 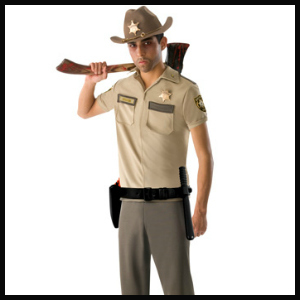 Or, you could of course go the other route and be the hero of the day with our awesome zombie hunter costume—axe included!